Building Fenway Center would be complex and expensive: Part of the 1.3 million-square-foot complex would straddle the turnpike, requiring a $35 million platform. The developer of Boston’s ambitious Fenway Center development is seeking $7.8 million in city tax breaks to proceed with construction, saying the $500 million mega-project could fall apart without urgent public assistance. John Rosenthal said the project’s ability to generate sufficient returns has been undermined by construction costs that have risen 20 percent since the project was approved by the city four years ago. Fenway Center is among the biggest and most complicated projects in the city. It would result in a towering complex of apartment buildings, offices, and stores that would cover the ugly scar of the Massachusetts Turnpike near Kenmore Square. But the project has suffered repeated delays due to legal and financial problems. Its failure would be the second meltdown of a project on state-owned air rights in recent years, following the 2007 collapse of the $800 million Columbus Center development. Rosenthal said he began asking the city several months ago for a $7.8 million tax break — the same amount the Menino administration recently awarded to a major redevelopment on the former Filene’s property in downtown Boston. He said the city has not yet acted on that proposal. Rosenthal outlined the project’s financial challenges Wednesday during a private gathering of business leaders and real estate executives in downtown Boston. He later responded to a Globe reporter’s questions about his comments at the gathering. Participating in the event was Jeffrey Simon, the head of real estate for the Massachusetts Department of Transportation, which owns the 4.5-acre property on which Rosenthal is seeking to build, and which stands to collect $226 million in rent from the development. Simon declined to comment through a spokeswoman Wednesday. Rosenthal said he has also approached Governor Deval Patrick’s office of housing and economic development to ask for help with his $7.8 million shortage but has not received a reply. Greg Bialecki, Patrick’s secretary of economic development, did not respond to a request for comment Wednesday. Rosenthal said the money would fill a gap in funding needed to satisfy his primary financial backer, Bentall Kennedy Group, a major real estate investment firm that wants a 6 percent return on the project. Fenway Center is particularly complex and expensive because part of the 1.3 million-square-foot complex would straddle the turnpike, requiring its developer to pay about $35 million for a platform to support its main parking garage and a 27-story building with 130 apartments, offices, and retail stores. Three additional apartment buildings would be constructed on scrubby parking lots between Beacon Street and Brookline Avenue, and the state is currently building a solar-powered commuter rail station off Yawkey Way. 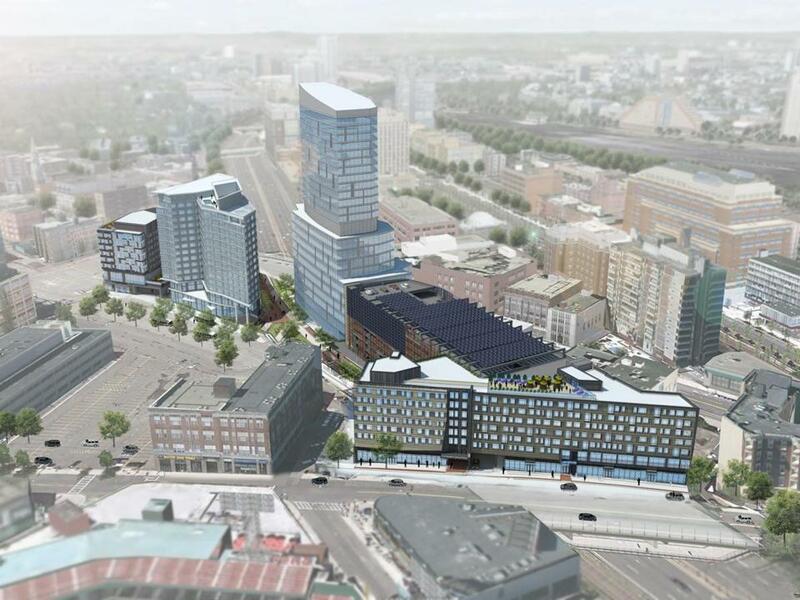 Fenway Center is also planned to include a community center, farmers market, bike-sharing station, pedestrian and bike paths, and several stores and restaurants. The project has obtained the support of neighbors and many public officials because of its potential to transform a gritty pocket of the city near Fenway Park. Though it was approved by the Boston Redevelopment Authority in 2009, the project was delayed by a soft economy and then became entangled in a lawsuit with an abutting property owner who objected to its size and layout. Rosenthal prevailed in that suit last year, but then lease negotiations with the state dragged on longer than expected. Earlier this year, the Massachusetts Department of Transportation approved revised lease terms with Rosenthal, who has committed to pay rent to the state for 99 years. But by the time the deal was finalized, the project’s construction costs had risen by $48 million. Rosenthal said that increase threw off the expected return of Bentall Kennedy, requiring tax assistance to get the firm to commit money for construction. One real estate specialist said building costs have risen significantly in recent years as increasing development activity in Boston and elsewhere created more demand for labor and materials. Executives with Bentall Kennedy, whose investment clients include the California Public Employees’ Retirement System and Delta Airlines, could not be reached for comment Wednesday. The company has backed several large office projects in Boston and its suburbs. It funded a major renovation of the former Verizon building in downtown Boston, which was recently leased by Brown Brothers Harriman. Rosenthal said he still is hopeful a tax agreement can be reached to move the project forward.